Imagine what it would be like to really understand another intelligent species on this planet. Denise Herzing has long been intrigued by what that would mean. As the director of the Wild Dolphin Project, she has spent thirty years studying the underwater behavior of dolphins in the wild, with a particular interest in their social lives and communication strategies. What are they saying? And, can we humans join in the discussion? Her new book, Is Anyone Listening? : What Animals Are Saying To Each Other and To Us, begins with her work with dolphins. Their behavior hints at a deep intelligence, their brains are big, they show signs of self-awareness, and some even use tools to help hunt fish. Building from there, she considers what we know about animal intelligence and the ability to communicate across species, looking at animals from prairie dogs to domestic dogs, and from parrots to primates. Intelligence in animals has typically been measured by comparing their abilities with people. 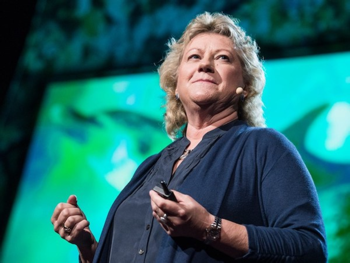 Denise argues that we need to resist the urge to see animals in terms of how we see ourselves and she wants to radically revise the way we define and measure intelligence in other species. Her work with dolphins has taught her that until we devise an approach to intelligence that isn’t human-centered, we don’t have a chance of meaningfully communicating with the animals who share the planet with us. Denise Herzing’s deep experience with dolphins and her wonder and celebration of the rich variety of life on this planet informs Is Anyone Listening? The book is a eye-opening guide to the opportunities and challenges of understanding other social worlds.